In April and May 2018, diners at Ginett Restaurant & Wine Bar can expect to feast on five new dishes centred around the award-winning Quercy lamb, famed for its succulent meat and mild aroma. Raised on the limestone plateaux of the Quercy region, the freerange lambs are the first to obtain the prestigious Red Label in France for the consistently high quality of their meat. The seasonal menu comprises of five lamb dishes that are prepared in various styles to highlight the different cuts of meat. The indulgent Lamb Leg (S$150++) features a 1.2kg charcoal-grilled lamb leg seasoned with smoked herbs and served with a side of cumin-spiced roasted carrots. Savour the slow-cooked Lamb Shank (S$38++) that is guaranteed to melt in your mouth, served with seasonal vegetables. The classic grilled Lamb Chop (S$42++) comes with stewed white beans with tomato jus. 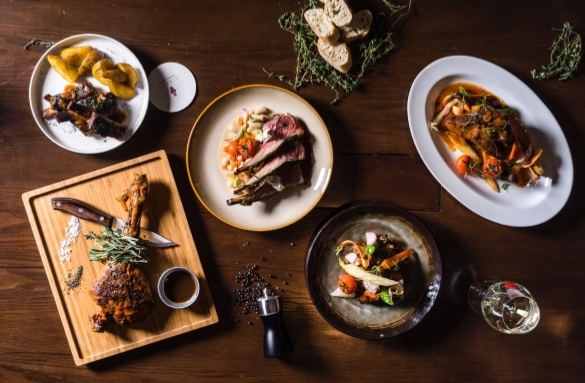 For a heartier selection, diners can opt for the Lamb Shoulder (S$38++), a fullbodied ‘navarin’ stew with fresh thyme; or the tender BBQ Lamb Spare Ribs (S$36++) which is served with pickles and crisp duck fat-roasted potatoes. Ginett’s seasonal lamb menu is available from 1 April 2018 to 31 May 2018. All prices quoted are subject to prevailing government taxes and service charge.